No Fault is the nation's leading provider of resilient athletic surfaces for playgrounds, splash pads, water play areas, jogging tracks and more. Since 1974, our surfaces have been installed throughout North America. Our surfaces include No Fault Safety Surface (poured-in-place), No Fault Safety Tiles, No Fault Rubber Mulch (Bonded and Loose-fill), and No Fault Artificial Turf. Playgrounds that are surrounded by rubber surfacing, such as No Fault Safety Surface (PIP), Safety Tiles or Rubber Mulch are safer than playgrounds with others types of surfacing. Sand, pea-gravel, and wood mulch require relentless maintenance and annual replenishment in order to sustain AS™ Compliance. These type surfaces also tend to attract insects, gnats, and animals. The best choice for playground surfacing is a unitary surface that requires little or no maintenance that is smooth and level allowing wheelchair access for children of all abilities. Should a child jump or fall from equipment, they are less likely to sustain a critical or fatal head injury when they land on a cushioned rubber surface that has impact absorbing properties for fall protection. No one surface is perfect for every playground, so it is important to consider your options carefully. In addition to safety, factors such as weather, budget, and durability should always be considered before choosing a playground surface. 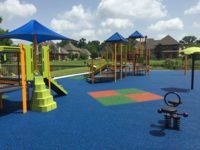 No Fault offers a variety of rubber surfacing products that will increase the safety, beauty, and life of your playground for years to come!